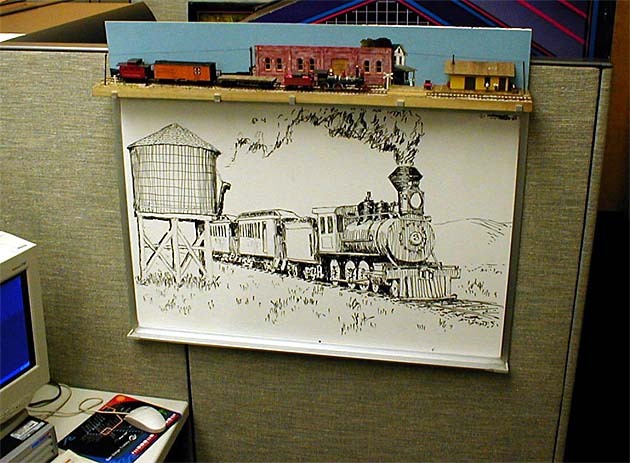 Jeff Hartmann, from Long Beach, California, made this tiny HO diorama to perch above the whiteboard in his office cubicle. It depicts a small town station named “Yensid” circa 1900. It was built on a 1″x4″ plank, three feet long. In addition to the station, there’s a spur to a brick warehouse. Jeff also penned the drawing covering the whiteboard, working over several days’ worth of lunch hours. Great way to bring your hobby along into your daytime hours! For more info, see Jeff’s website. The Scrapbook for June 2002 displayed some photos I took of a delightful pizza layout in Sn2 scale, made by Russ Haigh, of Willoughby, Ohio. 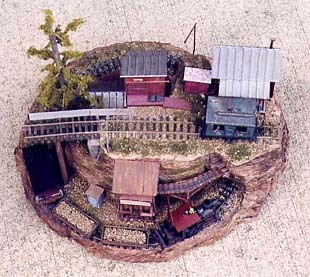 The layout featured a circle of Sn2 trackage (9 mm gauge), with an elevated length of Sn3 trackage up above (9/16″ gauge). Several alert readers noticed that, in my eagerness to show off the pizza layout down below, I had cut off the display at the top. They asked, “What’s up there, doc?” Russ has obligingly provided photographic evidence of the facts in the case. 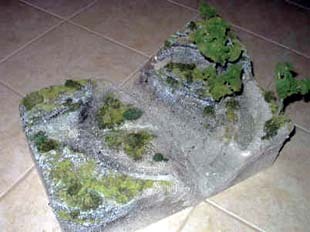 It’s the top part of the Cavorite mine depicted on the layout. 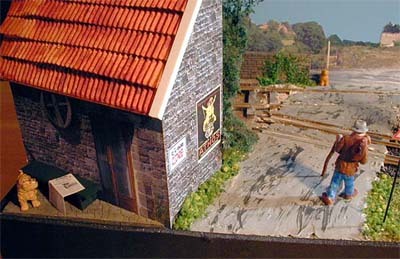 Note that several of the buildings on the layout — most notably the numerous privies — are made from Russ’s cardboard cutout kits, available in several scales under the brand name, “Spiffy Biffy’s©”. “I have been inspired by your website and the HOn30 Yahoo group to dust off my old AHM Minitrains equipment and build a micro layout. 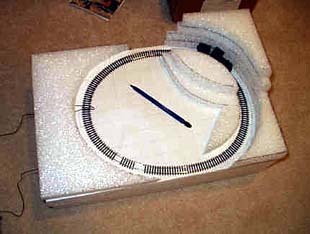 The track plan (dare I call it that) is a simple oval — just a three foot length of N gauge flextrack joined end to end. The layout measures 11″ x 17”, so it is a true micro (probably a pizza). 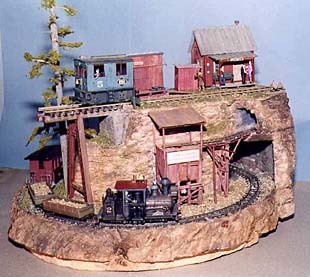 These two work-in-progress pictures are filched from John’s good-looking website, where he is documenting construction of this little HOn30 railroad. Be sure to visit if you want to see it grow toward completeness. From Italy, Ivan Furlanis sent this idea for extending my layout, Les Peupliers. The original line, built for a micro layout competition, was the size of two A4 sheets of paper end to end — about 8″x23″. It’s a 1/32 scale, dual-gauge railroad, crammed into a very small space and featuring both meter gauge (32mm) and extra narrow gauge (16.5mm) trackage. Ivan suggested, on the right-hand extension, modeling some farm buildings where the meter-gauge line can disappear, creating a fiddle area. Meantime, the dual-gauge track serves a farm warehouse. Then just the narrow-gauge rails enter another building, where there is a second fiddle area and storage for the electric switcher that serves the narrow-gauge industrial line. On the left-hand extension there’s an interesting and unusual dual gauge turnout (replacing the original sector plate) to extend the dual-gauge track over to a loading dock, where the narrow gauge switcher can deliver its freight loads. A small passenger station on the left end of the layout provides a second fiddle area for the meter gauge line. In this way, the meter gauge train can run from left to right and back with the engine always pulling the car. As there is now a small passenger station, we can add a small passenger railcar to the meter gauge line’s service. And all of this can be obtained in a space of about 47″x8″ (119×21 cm)! Ivan has lots of other interesting ideas and information, especially about trolleys (trams) and trolley buses at his website.